The warm weather is here and I am cranking out new ice cream recipes. This cherry chocolate chip ice cream recipe is my latest one. I just love cherries. So when my husband brought a bunch home the other day, I knew I wanted to make cherry ice cream. Of course I had to make mine cherry chocolate chip ice cream, because chocolate always makes everything better! Am I right? I love having an ice cream maker . It is so worth the money when you think about the price of organic, dairy free and gluten free store bought ice cream. You can make your own ice cream recipes for so much cheaper with just a handful of ingredients. 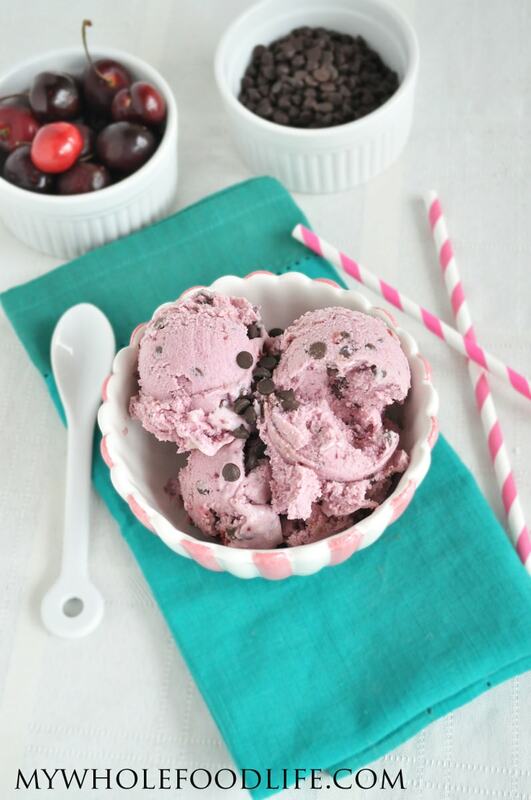 This cherry chocolate chip ice cream is dairy free, vegan, gluten free and even paleo friendly. It only takes 4 simple ingredients to make it. I love 4 ingredient recipes. I really think you could omit the sweetener all together in this if you happen to have some really sweet cherries. You will need to pit the cherries, which can be a messy job unless you have a cherry pit remover . Love mine! Make sure your ice cream bowl has been in the freezer at least 18 hours. In a blender , mix the coconut milk, 1 1/2 cups cherries and maple syrup. Blend for 1 minute or until everything is mixed together well. Pour the contents in an ice cream machine . Turn on. It should take 15-20 minutes. When the ice cream looks like it has about 5 minutes left, add in the remaining cherries and chocolate chips. The ice cream will be a soft serve consistency. It you like a harder ice cream, place it in the freezer for another hour. I like to store my ice creams in this tub . If you don't have an ice cream maker, you can make this recipe into popsicles as well. I have these popsicle molds and love them!